The region of Baden takes in several diverse and beautiful landscapes. It incorporates the famous mountainous Black Forest and runs down to the eastern section of the fertile Upper Rhine Valley. It is here on the banks of the Rhine where some of the best of Germany’s wines are cultivated and bottled. In fact the Badischer Winzerkeller, a regional wine co-operative, is one or Europe’s largest wine producers. There are many excellent local cultivars and a specialty of the area is one of my personal favorites — the rosé wine. In this particular wine growing area it is labeled Badisch Rotgold and is blended from a combination of Spätburgunder and Rülander grapes. In winter time it truly is a snow frosted wonderland, with the tall pine trees reaching up the mountain slopes. In summertime, it’s equally beautiful, and an adventurer’s playground with kilometers of hiking and cycling paths inviting exploration. For some relaxation you may want to visit one of the many luxurious health spas in the region. Set in stunning surroundings you can get pampered with massages and a variety of unique beauty treatments. The small city of Baden-Baden, located south of Karlsruhe, is aptly named. It is famous for its numerous high quality health spa resorts. In the warmer summer months of June and July, Lake Constance in the south attracts many holiday makers. Also known as the Bodensee, it is surrounded by picturesque wooded hills. Because of the beautiful weather, this majestic lake is a popular venue for sailing and a splash of colorful sails is a common sight on the water in season. Aside from its diverse natural beauty, the Baden region is a cultural smorgasbord. With a rich heritage including ballet and opera, there are quite literally hundreds of theaters in the area. In summer time there are weekly art and cultural festivals providing wonderful entertainment. The many museums too offer a variety of cultural interests. History enthusiasts can enjoy following the ancestry of the area. 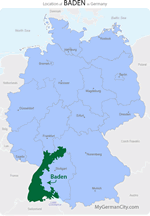 Many Dukes, Kings and rulers resided in Baden. Because of it’s location there are many ties to the French monarchy. Much of this information can be found by visiting the many museums and castles in the region. Although not really in Baden, the seat of the last German dynasty, Hohenzollern Castle, is well worth a visit. It is just one of the many castles in or near the area. Some are just relics of former glory but each has its own unique history. The Limes Road and Roman boundary wall are just two examples of Roman influence in the area. The university town of Heidelberg with its cobbled streets and stone bridges is particularly beautiful in summer time when the gardens are in full bloom. In addition to Heidelberg, if you are a culture enthusiast you will want to include places such as Freiburg, Pforzheim, and Mannheim in your touring plans. Home to many kings and rulers, Baden has an entertaining and detailed history. Your best bet is to have your guide book handy to reference as you explore the towns, monuments and sights.